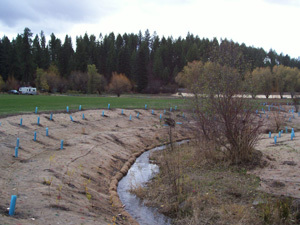 To decrease non-point source pollutant loads, the Palouse-Clearwater Environmental Institute (PCEI) has completed restoring 3,000 linear feet of stream bank on the South Fork Palouse River (SFPR) in Latah County, Idaho. 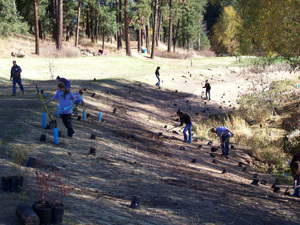 This is a cooperative restoration project involving Latah County Parks and Recreation Department, private landowners, local students, community organizations and volunteers. 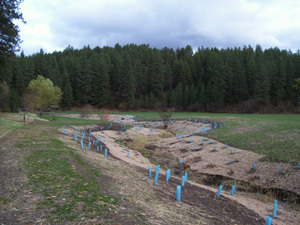 PCEI focused restoration efforts in the upper South Fork Palouse River Watershed on two stream segments within Robinson County Park. 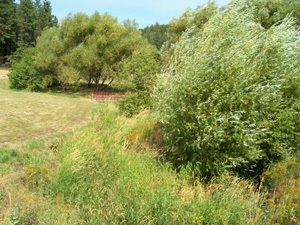 Down-cutting of the stream and extensive areas of active erosion characterize this reach. 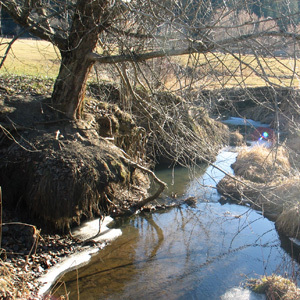 Restoration of this reach will have a significant impact on water quality and, utilizing local resources and community involvement, will be a cost effective way to maximize the impacts of US EPA 319 Nonpoint Source Funds. The SFPR is listed on the Idaho 1998 303(d) list as exceeding water quality standards for nutrients, temperature, bacteria and sediment. 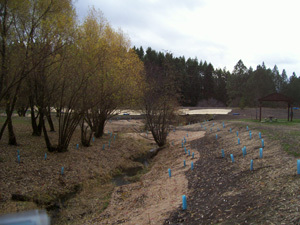 Other problems on the SFPR include reduced flow and habitat alteration. Past Beneficial Use Reconnaissance Program (BURP) studies, downstream monitoring and current water quality monitoring support the need for restoration on the SFPR (BURP 1996, BURP 1999, Hallock 1993, Myler 2002). 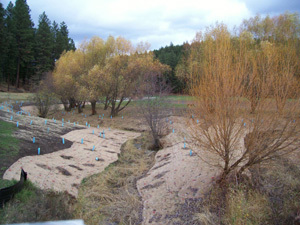 The proposed Best Management Practices and restoration techniques will reduce sediment and nutrient loading to the SFPR, while stabilizing temperatures, improving habitat for wildlife and cold water biota and mitigating local flood damage. Steep Banks (March 2005): Highly eroding streambanks with little overhead vegetation characterized the site prior to restoration activities. 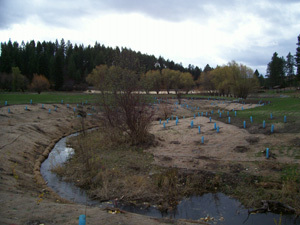 Restoration techniques will reduce bank slope, reconnect stream with floodplain and create a riparian buffer. 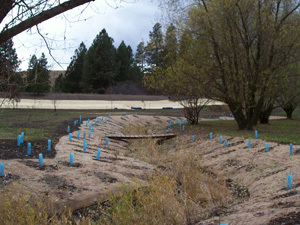 These activities will help reduce sediment and temperature within the South Fork Palouse River. 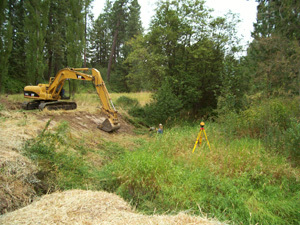 Beginning of the excavation (September 2005): Excavation begins at the up stream end of the site. 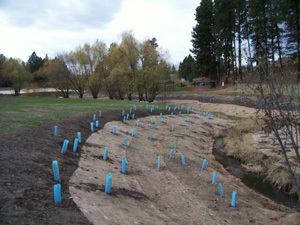 The banks will be resloped to reduce erosion and provide safer access to the river for park visitors. Monitoring Stream Cross Sections (March 2005): Ciara Cusack, AmeriCorps Riparian Habitat Specialist, measures the stream width. 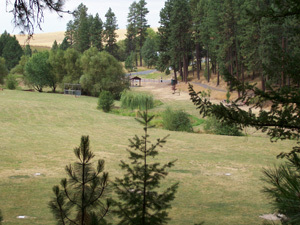 Photo Point V1 Upstream (August 2005): South Fork Palouse River looking upstream from culvert at Park entrance. Eroding and incised banks are covered with vegetation. 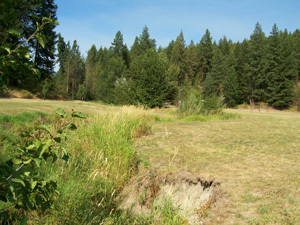 Photo Point V2 Upstream (August 2005): Incised and eroding banks are evident. 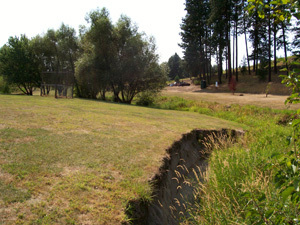 Photo Point V3 Downstream (August 2005): Steep eroding banks prior to restoration. 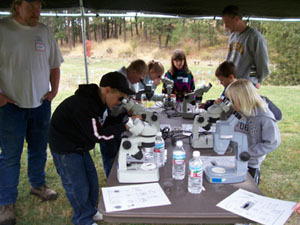 Macroinvertebrates Station (October 2006): On October 3, 2006 a Watersheds Festival was held at this site. One hundred sixty local area elementary schoolers were treated to a variety of environmental education stations such as tree planting, exploring water resources, habitreks, and creative wildlife. 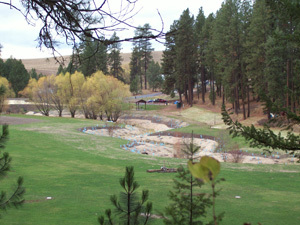 Photo Point V6 Downstream (March 2005): Unnamed tributary feeding the main stem of the South Fork Palouse River. 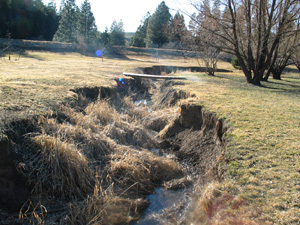 Unstable banks contribute to yearly sediment loading to the South Fork Palouse River. 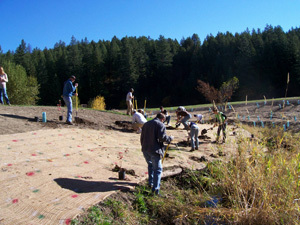 Volunteers Laying Erosion Control Fabric (October 2005): This coconut fiber fabric will help prevent erosion of the stream banks until the grasses and plants take hold. 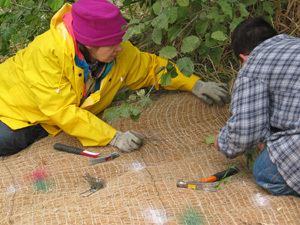 Stapling Down the Erosion Control Fabric (October 2005): The erosion control fabric is fastened to the ground with landscape staples like the ones these volunteers are using. Learning through action! 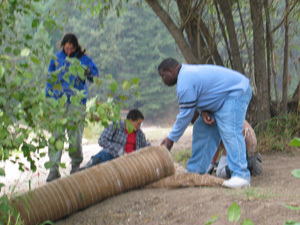 (October 2005): Environmental science classes from Washington State University came out to Robinson Park to actively learn about restoration and to plant native trees and shrubs. 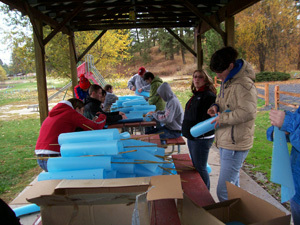 Building blue tubes (October 2005): Volunteers build blue tube plant protectors. 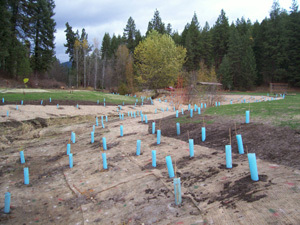 The tubes will be placed over young plants in order to protect them from being eaten by rodents and deer, and from being mowed or crushed. Making a Difference (October 2005): Volunteers plant native shrubs and trees as part of the annual Make A Difference Day. Planting Trees (October 2005): Landscape Architecture students from Washington State University planting trees at one of our first planting events. 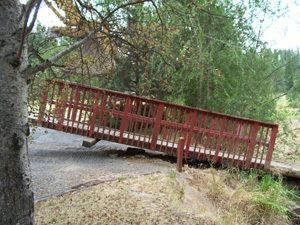 Good Bye Old Bridge (August 2005): Removal of this old bridge was one of the first steps for excavation of steep banks. Excavation (August 2005): Excavation at the upper end of the site to help create a more natural bend so that water is not causing under cuts and erosion. 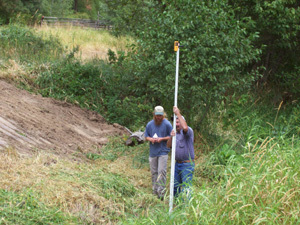 Running the Grade Rod (August 2005): Project Manager Ken Hobson and Excavator Mark Blesdoe discuss elevations to ensure that the excavation meets the engineering specs.